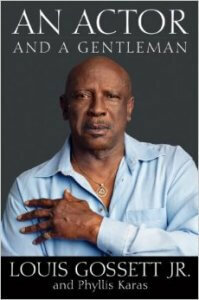 Academy Award Winner Louis Gossett Jr.
You will find great value in reading Actor And A Gentleman by Louis Gossett Jr. He is a great humanitarian with and outstanding story! Please enjoy a snapshot reading of his book in the 1-minute video below. Lou is a very down to earth, grounded fun-loving man with a heart of gold and you will feel his energy as you read each and every page of the life of such a dynamic man! Louis Gossett Jr. is an amazing human being, born May 27, 1936 in Sheepshead Bay Brooklyn, NY, Lou has a flair for projecting quiet authority, mixed with rare emotional intelligence and an authentic character. I met Lou in the Dominican Republic in 2005 where I was fortunate enough to present him a ‘life time achievement award’ for his extraordinary film and theater vocation. Lou has scored well personally in a string of diverse and occasionally challenging roles. Lou was a member of the drama club at Abraham Lincoln High School and encouraged by his high school English teacher, Mr. Blum to pursue acting. His first role was a play called, ‘You Can’t Take It With You’. The aspiring actor caught a break at his first Broadway audition for “Take A Giant Step” (1953), where, beating out 400 other candidates, the then 16-year-old landed the lead. For playing “Anderson Walker”. For multiple episodes. For playing “Bessie’s Father”. For episode “Future City”. For playing “Frank Crosby and Richard Crosby”. On 20 May 1992. At 7000 Hollywood Blvd. Please stay tuned for part 2 of this 3 part series and incredible life changing stories shared by Lou in his first class book An An Actor And A Gentleman.